Uganda’s Rwenzori Mountains rise 5000m from the heart of Africa. At their summits are some the only equatorial glaciers on Earth. But these “Mountains of the Moon,” whose very existence caused a sensation in Europe when they were first climbed in 1906, are changing fast. Their glaciers have shrunk by more than 80% in the last century, and scientists predict that the remaining ice will disappear in less than 20 years. The future of the mountains, their remarkable endemic biodiversity, and the Bakonjo people who call them home is uncertain. 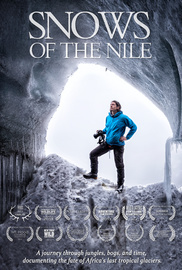 Snows of the Nile follows Neil Losin and Nate Dappen, two scientists and photographers, on an ambitious expedition to re-capture historical glacier photographs from the Rwenzoris. If they could retrace the steps of the Duke of Abruzzi’s legendary 1906 ascent, brave the Rwenzoris' notoriously unpredictable weather, and re-capture Vittorio Sella's glacier photos, their images would bear witness to a century of climate change.